Charleston bed and breakfast travel guide for romantic, historic and adventure b&b's. 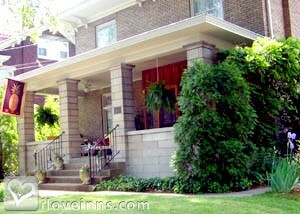 Browse through the iLoveInns.com database of Charleston, West Virginia bed and breakfasts and country inns to find detailed listings that include room rates, special deals and area activities. You can click on the 'check rates and availability' button to contact the innkeeper. Do you want to have a vacation that you will never forget for the rest of your life? Well the city of Charleston in West Virginia can make your relaxation dreams into reality. Having more than enough room for four thousand guests, Charleston can serve you whether you are traveling alone, with a special someone, or with your entire family. Most visitors prefer to stay at the different Charleston bed and breakfasts. Offering world class accommodation at a lesser price, the bed and breakfasts in Charleston are known to have wonderful innkeepers who will provide you all your needs. There are several places to visit while in Charleston. First, you can check out the West Virginia State Capitol Complex and perhaps have your picture taken at the front entrance. You can also visit the West Virginia State Museum, or the Charleston Town Center Mall if you feel like shopping. By Brass Pineapple B&B.